I love digital photography. I can take an unlimited number of pictures, although I might need extra storage on my computer to do so. If the colors are a bit off, the picture is too dark or too light, or just needs to be cropped down, I can adjust it easily through Photoshop Elements. If I feel fancy, I can try different filters and effects to see if I like them or not. I switched to digital pretty early on, but still have a lot of film prints to scan and convert to digital. Scanning is not hard, but it takes time and many of the pictures require adjustments. My wedding photos have mostly turned to sepia. Other color prints are faded. Some of the black and white have become streaked with minor scratches. I can use them “as is” if I want, but they mostly all look better with some minor work in Photoshop. That all takes time to do. Right now I’m doing a photo challenge to take at least one picture a day. I’ve enjoyed it more than I thought I would. I’ve gotten shots I wouldn’t have simply because the camera was out. I could never do that with film. It was too expensive to take so many photos (and failures) and the processing not always reliable. It was frustrating to have extra prints made up and the colors not match the original prints. No one at the developer could explain why nor did they particularly care. 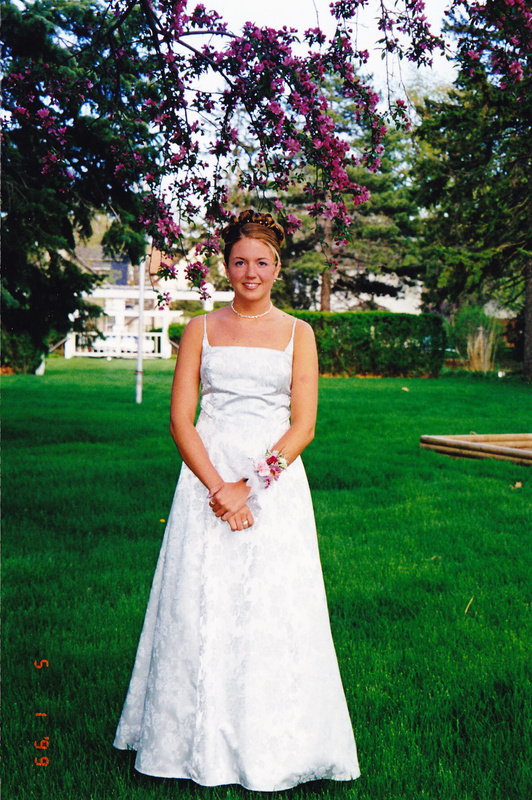 This is one of the last shots I took with film before I went digital – my daughter at prom. Isn’t she pretty? So grown-up and ready for fun. Word for tomorrow – FRIVOLOUS. If you prefer to work ahead, see the list for the week under “A Word A Day”. I’ve been trying to convert all our family photos to digital for a while. I kind of stalled out. I syllable have a ways to go.